A friend in the VC community asked me to evaluate a mobile wishlist and deal finder. Interestingly, that’s what SF darling Pinterest first raised money for with HelloTote. I advised my friend to focus on how deeply and frequently consumers get delighted by the product. Low delight, high frequency products offer a user low levels of delight daily. Facebook, Instagram, YouTube and Zynga are great examples. High delight, low frequency products offer delight a handful of times each year. RentTheRunway and Fab.com acted upon 50% off deals fall in this category. What you don’t want to offer is a few dollars of savings or a few comments from friends a few times a year. That is what a comparison search engine or mobile shopping tool might do. Web comparison search engines like Shopping.com and Kayak.com need to invest heavily in advertising and search engine optimization because their product delivers only moderate savings and delight. They struggle with retention. A mobile app has an even more difficult time with retention because intent-based marketing opportunities like Search Engine Marketing on the web are immature on mobile. And, of course, the deeper the delight you provide the more you can charge a consumer. What impresses me about BirchBox is that they’re doing everything with their community, points, deals, instructional videos, and personality. On the other hand, I fear Foursquare doesn’t offer quite enough delight beyond just badges with their low levels of interaction among the community and low monetary rewards. 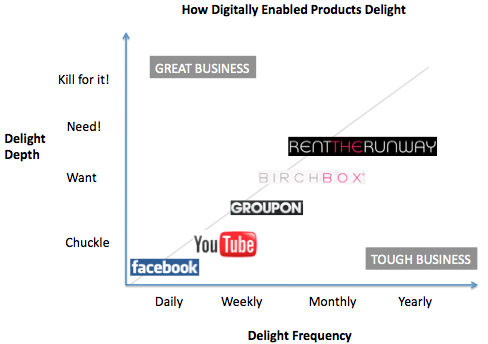 Lastly, “time until first delight” is a metric that will drive retention and virality. A wishlist and deal finder can struggle to make a user delighted on their first visit. On the other hand, a social site the lets a user interact with a friend or earn a badge, or a daily deal sites can offer 50% off, can do much better on offering some delight over the first 30 days. How often do your favorite products delight you? Where to they fall on the chart? Each year from 2002 to 2007, over 300 venture backed start-ups had exits (peaking at 465 in 2007). Steve Ballmer just mentioned that Microsoft plans to continue making 20 acquisitions a year, most for under $100M. Over the last twelve months, Dun & Bradstreet, which is 1/20 the size of Microsoft by market cap, bought four technology and media businesses each for likely under $100M. If a company raises $5M and exits for $35M, lots of employees and investors are happy. I analyzed 9 recent deals. Specifically, those of CNET, shopping.com, Daily Candy, Farecast, Kaboodle, Delicious, Sphere, Reddit, and DPReview. The goal was to find out why these firms were bought. Of course, there are supposed to be synergies in these areas. Having a big audience of consumers was not enough. Buyers want to know that a better mousetrap will not come along and simply steal the entire audience away (e.g., Friendster and Facebook in the U.S.; Techmeme and Technorati). And technologies need to be very complementary to a growth areas of a buyer’s lines of business. In these deals, the buyers of the web applications seemed to fall into a few buckets. Media firms, like CBS and Hearst. eCommerce transaction facilitators, like Amazon and eBay. Search firms with advertising businesses, like Microsoft and Yahoo! While a severe recession will certainly impact the bottom line of these businesses, its hard to imagine a scenario that significantly impacts the debt-free, cash generation engines of Amazon, Microsoft and Google (each throws off greater than $1B in cash flow from operations annually). Sphere was bought by AOL for its network of partners who allow a pop up with AOL’s content featured. I put a deal like YouTube in this category because the network of publishers putting content on YouTube, and promoting it to their friends and readers, was difficult to replace. Reddit was bought by CondeNast for its technology which could be given to audiences across CondeNast’s properties. It fits with CondeNast’s desire to do more online with communities. It was also far cheaper than Digg. Delicious was bought by Yahoo! for its technology to potentially improve search results and enable Yahoo!Buzz. Farecast has price prediction technology that fits with Microsofts push into eCommerce search. Skype was bought by eBay because it was thought that its technology would facilitate transactions in areas like autos where a conversation is helpful. CNET, Daily Candy, Kaboodle, and DPReview have original content related to what people buy. These businesses often have a loyal following, email lists, and great organic search rankings. When buyers look for synergies, these business can provide existing content to new platforms or drive traffic to existing eCommerce sites or advertisers. Also, they have loyal followings to strong brands that are unlikely to leave anytime soon. What do you think? Are there any other major things that buyers look for in a digital media business? And stay tuned for Part II: Why no one is buying Digg, even though its valued at $175 million.